Since then I found a short video clip online of an RFK campaign appearance in Pomona. The curious thing is that the tree-filled backdrop didn’t seem to be along East Second Street, where Robbie’s was located. Did RFK stop at Fairplex or Cal Poly or…? So that’s a mystery. Here’s a link to the Jeff Greenfield CBS report from May 2008. The video, alas, doesn’t seem to work anymore (I last watched it a couple of months ago), but you can try it yourself, or at least read Greenfield’s text story. “There was also a lot of humor. Robert Kennedy had very little patience with the platitudes of politics, and he often mocked them — and himself. Listen to his explanation to the citizens of Pomona, Calif., why he won’t put on the oversize sombrero they gave him. “The crowd implored him to try it on. One more loss from RFK’s early demise. FORTY YEARS ago Tuesday, Robert F. Kennedy came to Ontario and Pomona . 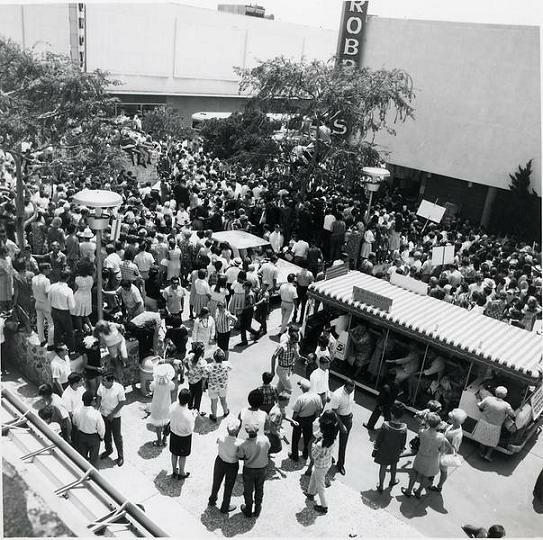 Kennedy hit both cities on May 20, 1968, part of a frenetic day of campaigning in Southern California before the state’s June 4 Democratic primary. ” Kennedy Due Here Monday,” the Saturday edition of the Pomona Progress-Bulletin reported on Page One. Kennedy would speak at Robbie’s, a banquet hall on East Second Street, for which tickets would be sold in advance for $2.50. May 20 began with Kennedy and his entourage leaving L.A.’s Ambassador Hotel, where they were staying, to make campaign stops in Alhambra, San Gabriel and Duarte. Around noon, his motorcade of two convertibles, two motorcycle officers and two busloads of journalists exited the 10 Freeway at Garey Avenue and headed south. At Second Street, they turned left to travel the four blocks to Robbie’s. Terry, then 14, was an eighth-grader at Fremont Junior High. He and his classmate Lou Maestas cut class and walked to the downtown pedestrian mall to see Kennedy , guessing correctly that it was the place to be that day. When Kennedy ‘s convertible rounded the corner from Garey, Terry and Maestas ran alongside. They paced his car for two blocks as Kennedy shook or touched hands with people in the crowd. The Prog painted a vivid description. ” Kennedy appeared weary as he rode into Pomona but he smiled steadily and leaned down to shake hands with his admirers who followed his slowly moving convertible along the Mall. He was in his shirt sleeves, sunburned, the familiar shaggy haircut windblown. Not everyone was on board: One or two signs for Democratic rival Eugene McCarthy were spotted. Kennedy changed shirts, put on a jacket and, refreshed, spoke to a luncheon crowd of 400, many of them Pomona Valley movers and shakers. His speech, most of which was printed in the Prog, was boilerplate stuff. But the New Yorker did make a local joke. At about 1:30 p.m., after the luncheon, Kennedy ‘s motorcade headed back up Garey to the 10 and east to Ontario. His guest for the ride: Ontario Mayor Howard Snider. “The driver and Kennedy were in the front seat and I was in the back with his dog,” Snider, now 79, told me with a chuckle last week. Because it was an open car, and he had a dog to contend with, Snider couldn’t really have a conversation with the candidate. But it was a memorable ride. Other motorists on the freeway spotted Kennedy . “People would honk their horn. They would see who it was and beep their horn,” Snider said. At Vineyard Avenue, the motorcade headed south to Ontario International Airport. Some 1,500 people were waiting. Many held pro- Kennedy banners. A few had posters for McCarthy and Richard Nixon. One jokester waved a sign reading “Mrs. Kennedy for Secretary of Labor,” referring to her and her husband’s 10 children. A description in the Report was picturesque and, viewed in retrospect, eerie. “… his jacket was missing, his hair was disheveled, his bright blue shirt was hanging from his trousers and his arms appeared scratched and red from the clutching grasps of the crowds. Kennedy gave a five-minute speech outside the terminal. He was against taxes, welfare, Vietnam and a guaranteed annual wage. “Will you support me in my campaign?” Kennedy concluded. Soon he was inside. Snider, a Republican, said Kennedy posed for pictures with him and other dignitaries. A Daily Report photo showed Kennedy walking along the passenger concourse to a waiting plane as more hands reached out for him. Kennedy flew to San Diego, made four appearances there that afternoon, then landed at Long Beach before a motorcade took him through L.A. suburbs, including Monterey Park. Kennedy was held about the waist by his security guard as he stood on the hood of the convertible, shaking hands. The clutching crowd grabbed – why not? – his shoes. An aide had to lend Kennedy his own shoes to be presentable for a speech at a synagogue. Fourteen days later, on the night of June 4, Kennedy won the California primary. But shortly after midnight, during a victory party at the Ambassador Hotel, gunman Sirhan Sirhan mortally wounded him. He died the next day, June 6, 1968. Bob Terry recalls how school let out when President Kennedy was killed in 1963, but Terry was young enough that the event didn’t mean much to him. Robert Kennedy ‘s death was different for Terry and his pal Maestas. “Here we were, tough little eighth-graders,” said Terry, now a 54-year-old salesman in Rancho Cucamonga, “but when we heard he was killed, me and him were just in tears. We couldn’t let anybody else see us. In Googling around to see if I could find the video working somewhere else, I came across this — the possibility that Sirhan Sirhan was stalking RFK during his visit to Pomona. I was at Robbie`s that day. A lot of people. The Pomona Library has a couple of pictures of that day. I am in the crowd somewhere. Like I said there were a lot of people. Last year David did a piece about me & a buddy ditching Fremont Jr. High that day and running along side RFK’s motorcade. I can’t believe I’m that old and it seems like yesterday. I still treasure the fact that I got to shake his hand twice that day. I was 7 with my mother waiting on Rosemead Blvd in El Monte I believe, my mother holding me on her shoulders. As RFK drove by he patted my head and placed his campaign hat on my head. I still have the hat put in a box. I wish I knew how to get documentation showing him doing so. I’ll never forget listening to the news on TV about his death. I ran to my parents’ room crying. On 1968, the 8th grade class from “Granada elementary school” began our walk to “ALPHY’S RESTAURANT” Alhambra ca. This day was important because we were learning “THE CONSTITUTION OF THE UNITED STATES OF AMERICA” and about to actually meet “BOBBY KENNEDY” on his campaign to Presidency. He drove up in a convertible just like his brother JFK. and stopped in the parking lot of “ALPHY’S.” He was handsome and had a smile that lit up his entire face. He was kind and generous with the handshakes among us kids. I was one of those lucky kids that got to actually look in his smiling face and shake his hand. I was in awe. Then as fast as he came, we watched his car and the cars of his security drive off. It was an experience I hold dear to my heart. The next day (I think, it was the next day) I came home from school, ate dinner, then turned on the TV. On every channel this is what was said, in a total panic, crying, and screaming people, there laid “BOBBY KENNEDY” on the ground with tons of people hovering over him as he lay shot in the head…OMG HOW COULD THIS HAPPEN…I JUST TOUCHED HIM AND LOOKED INTO HIS SMILING FACE, AS HE SHOOK MY HAND. I fell to my knees in prayer, and begged God to make this not be true, and if it is…please please let him be ok…I stayed up all night praying, and crying. It was a very personal thing to me and my 8th grade class. I recall that the Dean at Pomona Catholic High School looked the other way as we left the San Dimas school to go and see Robert. I remember being on the mall when he approached and yes he was being held by the waist. I did not get to shake his hand as I had shaken his brother’s hand at Chavez Ravine in I think 1959 or 60 as his motorcade drove around the ravine and with an outstretched hand I made contact, and from the car came a campaign button that said “Viva Kennedy”. Yeah, I guess we all wanted them to be here with us, and I shall not forget those times in Pomona, or Los Angeles when I was touched by their presence. I still have the button.